Kick off your visit on the 2nd (Wed): take in the architecture and atmosphere at Paleokastritsa Monastery, take a stroll through Corfu Old Town, and then explore the ancient world of Old Fortress Corfu. On the 3rd (Thu), you'll have a packed day of sightseeing: take in the dramatic natural features at Kaiser's Throne, stroll through Barbati Beach, and then contemplate the long history of Kassiopi. For other places to visit, traveler tips, where to stay, and tourist information, read Paleokastritsa online trip itinerary maker . New York City, USA to Paleokastritsa is an approximately 16.5-hour combination of flight and bus. The time zone changes from Eastern Standard Time to Eastern European Time, which is usually a 7 hour difference. In September in Paleokastritsa, expect temperatures between 82°F during the day and 65°F at night. Wrap up your sightseeing on the 3rd (Thu) to allow time to travel to Lindos. Kick off your visit on the 4th (Fri): take in the spiritual surroundings of The Church of the Panagia, then enjoy the sand and surf at Agathi Beach, and then enjoy the sand and surf at Tsambika Beach. Get ready for a full day of sightseeing on the 5th (Sat): head outdoors with Pefkos Beach, then delve into the distant past at Acropolis of Lindos, and then enjoy the sand and surf at Lindos Beach. To find reviews, other places to visit, and tourist information, read Lindos online driving holiday planner . Traveling by combination of bus and flight from Paleokastritsa to Lindos takes 9 hours. Alternatively, you can do a combination of bus and ferry. Traveling from Paleokastritsa in September, you can expect nighttime temperatures to be a bit warmer in Lindos, with lows of 73°F. Finish your sightseeing early on the 5th (Sat) so you can travel to Agios Nikolaos. Start off your visit on the 6th (Sun): kick back and relax at Voulisma Beach, then explore the activities along Lake Voulismeni, and then step off the mainland to explore Fortress Spinalonga. To see reviews, other places to visit, more things to do, and tourist information, you can read our Agios Nikolaos tour itinerary planner . Getting from Lindos to Agios Nikolaos by combination of bus and flight takes about 6 hours. Other options: do a combination of bus, flight, and taxi; or do a combination of bus, flight, and shuttle. Traveling from Lindos in September, plan for a bit cooler nights in Agios Nikolaos, with lows around 64°F. Finish up your sightseeing early on the 6th (Sun) so you can go by car to Rethymnon. Kick off your visit on the 7th (Mon): pause for some serene contemplation at Monastery of Arkadi, then steep yourself in history at The Venetian Fortezza, then take in the exciting artwork at Cloclo's Art Handmade Creations, and finally wander the streets of Rethymnon Old Town. Get ready for a full day of sightseeing on the next day: enjoy the sand and surf at Episkopi Beach, then explore the activities along Lake Kournas, then pause for some serene contemplation at St. Nicholas Church, and finally take in the architecture and atmosphere at Four Martyrs Church. To see traveler tips, other places to visit, more things to do, and more tourist information, use the Rethymnon trip maker tool . Traveling by car from Agios Nikolaos to Rethymnon takes 2 hours. Alternatively, you can do a combination of taxi and bus; or take a shuttle. September in Rethymnon sees daily highs of 84°F and lows of 68°F at night. Finish your sightseeing early on the 8th (Tue) to allow enough time to ride a ferry to Akrotiri. Kick off your visit on the 9th (Wed): don't miss a visit to Akrotiri LightHouse, then do a tasting at Santo Winery, then kick back and relax at Perivolos, and finally explore the ancient world of Akrotiri. Here are some ideas for day two: tour the pleasant surroundings at Vlychada Beach, zoom along the surf with a waterskiing or jet-skiing adventure, and then kick back and relax at Red Beach. To see where to stay, photos, maps, and tourist information, go to the Akrotiri trip itinerary planner. You can ride a ferry from Rethymnon to Akrotiri in 2.5 hours. Another option is to do a combination of taxi and ferry. Expect a daytime high around 82°F in September, and nighttime lows around 70°F. Finish up your sightseeing early on the 10th (Thu) so you can catch the ferry to Naxos. Your cultural itinerary includes sights like Old Town and Temple of Apollo. 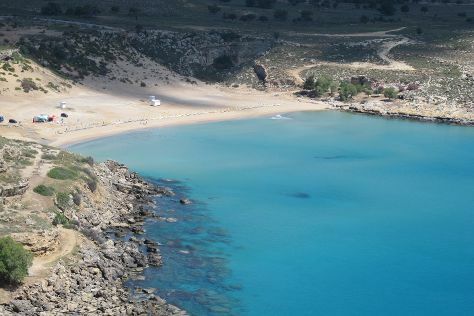 Explore hidden gems such as Maragas Beach and Plaka Beach. There's much more to do: look for all kinds of wild species at Alyko Beach, delve into the distant past at Portara, enjoy the sand and surf at Agios Prokopios Beach, and stroll through Mikri Vigla Beach. To find where to stay, photos, more things to do, and more tourist information, use the Naxos day trip app . You can ride a ferry from Akrotiri to Naxos in 1.5 hours. 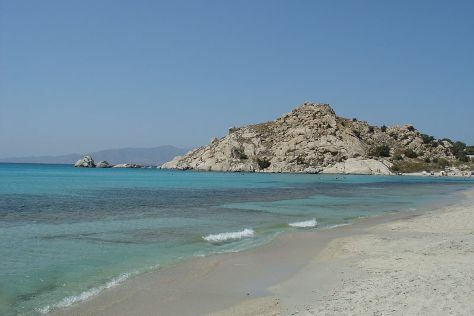 September in Naxos sees daily highs of 81°F and lows of 70°F at night. Finish your sightseeing early on the 13th (Sun) so you can travel back home.